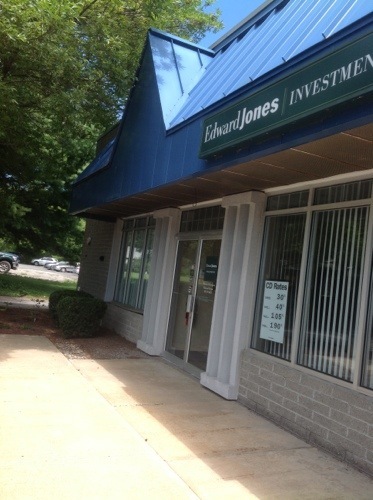 In Clifton Park, NY (southern Saratoga county) on Route 9, a savvy financial advisor has been watching trends in landscaping. 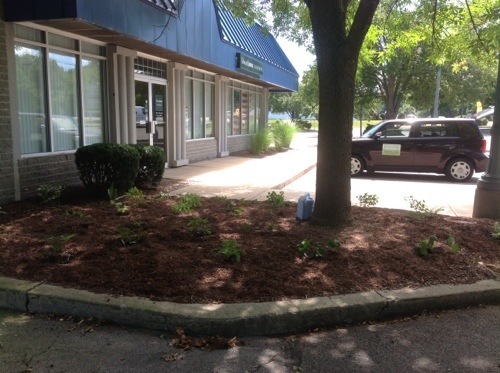 Deborah Christopher, whose Edward Jones office is located in a strip mall on State Route 9, heard about prominent entomologist Douglas Tallamys research and ecological trend-setting for redefining curb appeal to be more sustainable and habitat restorative. 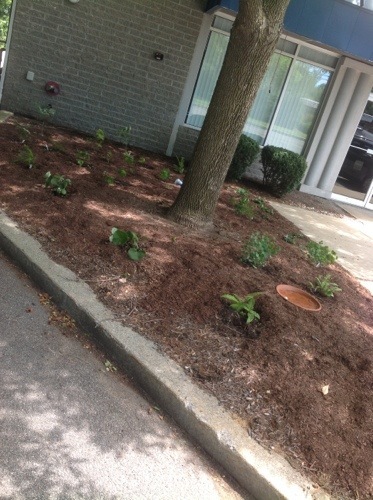 Deb reached out to me for a habitat garden landscape renovation outside her office space; she loved the idea of a design that was both, beautiful and low maintenance, as native plant landscapes naturally are. 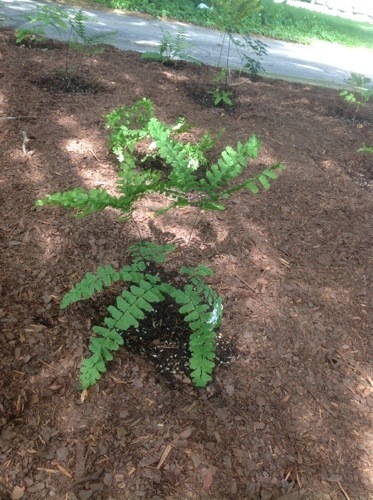 The space at the front of Debbies office is shady, sandy soil and dry, located on the west side of the building and under a mature Ash tree that has a monopoly on the beds excess moisture. 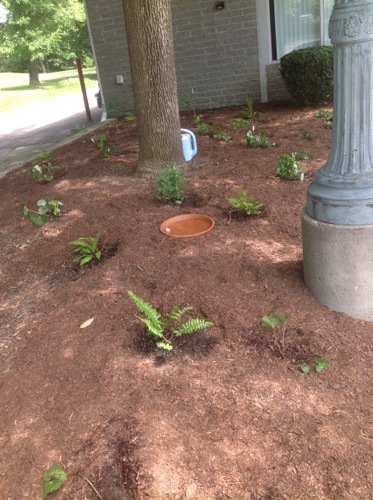 The native plant choices had to be able to flourish in dry, woodland garden conditions. Adiantum pedatum, Maidenhair Fern was a shoo-in choice for the niche conditions, as its elegance is unparalleled and given its druthers the plant would grow in the dry shade of a woodland garden anyways. Thalictrum dioicum, native Meadowrue was another miniature showcase species that thrives on the neglect of dry shade. 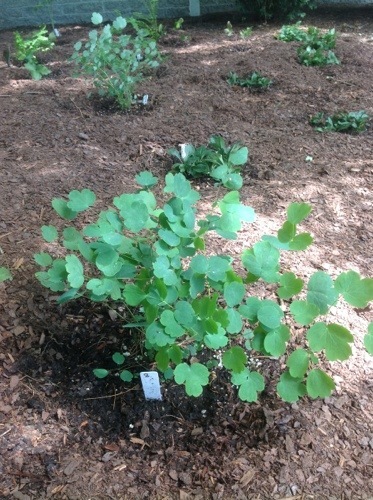 Other species used include Christmas Fern, Hepatica, Black Cohosh for some height and Wild Ginger. Viola triloba, Three-Lobed Violet is another plant in the woodland garden scheme we chose, and the Violas are larval host for the marginalized Fritillary butterfly family, so including them in a landscape improves the habitat. Given the dry, desert like conditions it seemed apropos to have a water feature, even one this rustic (this is simply a terra cotta pot base, with a rock for a perch) brings the element of water into the landscape and provides a drinking space for birds and butterflies. The south side of the building is in the sun all day but has the same dry, sandy soil conditions. Asclepias tuberosa, orange Butterflyweed seemed the natural plant choice as it thrives in dry sand. 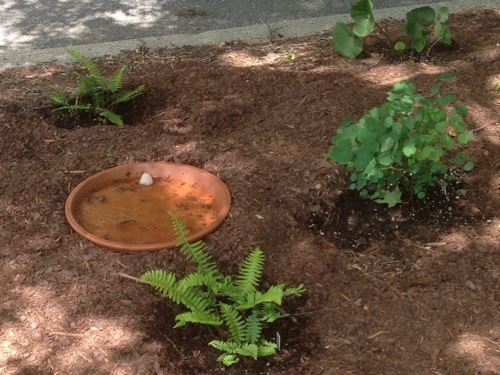 We don’t typically see corporate America as a warm audience for our subversive message of creating habitat garden spaces and thoughtfulness for wildlife. 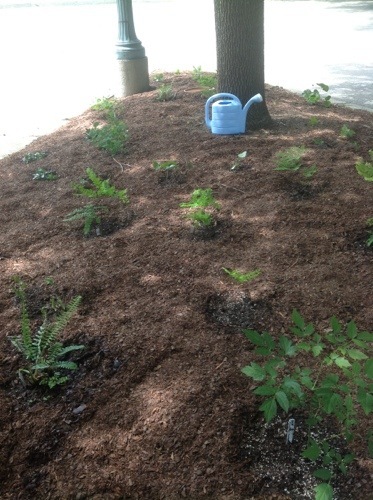 I was fortunate enough to come in contact with a future-minded corporate investment specialist, who coolly evaluated the current trends in run-of-the-mill landscaping practices, and saw the value in redefining curb appeal to include habitat garden projects and native plants. Debbie Christopher is a trend setter sweetheart and one of a kind, and she was lovely to work with.